The NTFS file system is pretty verbose and redundant. With the introduction of Windows Vista, there is even more file system redundancy with the Volume Shadow Service (VSS). 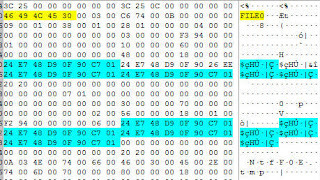 Windows uses a 64 bit timestamp to track most file system events (created, accessed, written, modified). This 8 byte value represents the number of 100-nanosecond intervals that have passed since midnight UTC, January 1, 1601. There have been many times where I have found myself searching for these Windows timestamps in the various internal files. EnCase and most of the other forensic tools show you the contents of the master file table (MFT), but what if the reference to the file and folder is no longer there? This EnScript basically takes a starting date/time combination and then an ending date/time combination and generates an appropriate GREP search expression for that date range. 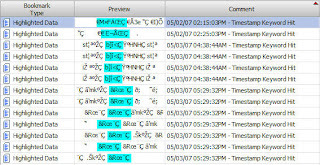 It then searches any selected (checked) files for that date range and then bookmarks the findings. 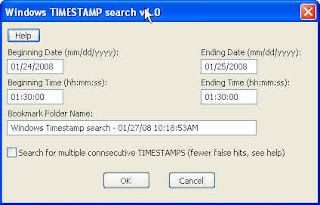 Because Windows timestamps are very granular and accurate down to a 100 nanosecond interval, exact date/time matching is impossible, but its very close depending on the size of your date range. Smaller date ranges (a couple of days) will be much more accurate than large date ranges (several months). The option at the bottom allows you to look for consecutive timestamps, i.e. a timestamp matching your date range, followed by another timestamp, not necessarily in your date range. This is if you want to specifically look for orphaned MFT records in unallocated or the $Logfile, since an MFT record has eight timestamps, a group of four consecutive timestamps and then another group of four, then setting this option would only find those types of records. This EnScript bookmarks any found timestamps and then reads the timestamp and places it in the comment field for sorting purposes. The timestamp in the comment field is GMT and your case settings have no effect on it. If you choose to sweep the timestamp and view it through the bookmark styles, then your case timezone setting applies. Another note... The script is also putting different times in the bookmark comment than I get when I select the data and bookmark it as a Windows date/time. Maybe it's not adjusting for the timezone of the image?